Fortunately nowadays, there is so much inspiration online for presents that you can make yourself. 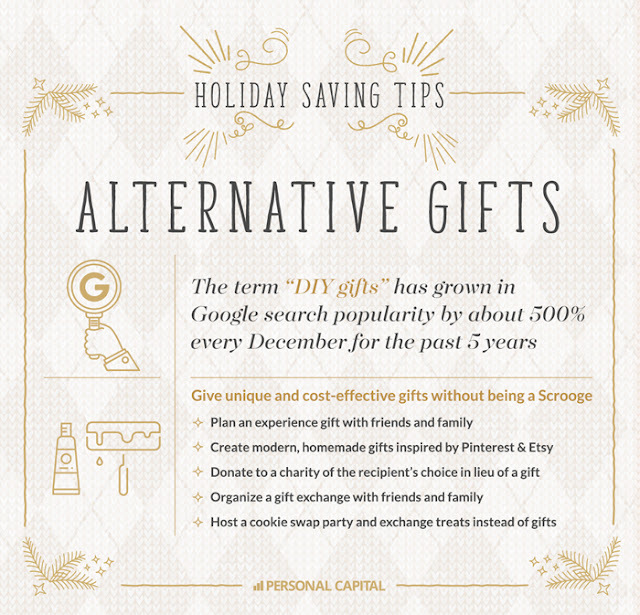 DIY gifts are great if you're trying to save money. 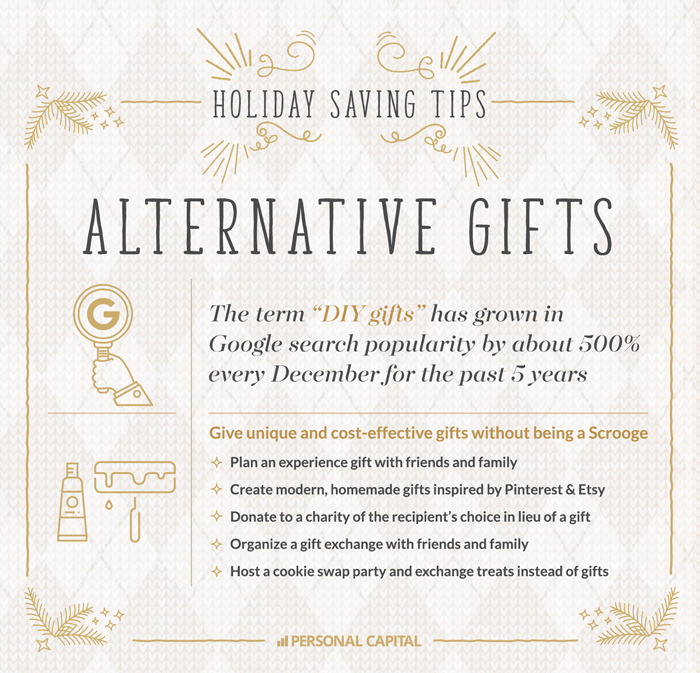 Plus, giving something that you made yourself is often more thoughtful. Making my own Christmas presents to people by using more cost-efficient resources (along with my calligraphy skills) has allowed to give presents to more of the important people in my life while still not breaking the bank. Cards, especially ones around the holiday season, are a classic when it comes to calligraphy projects. Just do a quick Google search, and you'll be able to find a huge volume of ideas. Personally, one of my favorite places for inspiration for hand-lettered cards is the Postman's Knock, who has made an abundance of tutorials for cards utilizing calligraphy. As for the paper itself, you can make several cards using one piece of "fancy" art paper (e.g. watercolor paper, card stock, etc.) or one piece of pretty scrapbook paper, meaning it doesn't cost much for several of these simple, handmade gifts. Another great way to put your hard-earned calligraphy skills to use this Christmas is by making wall art. This can be a variety of things, such as original, hand-drawn art, a hand-painted wooden sign (something like this), chalkboard art using chalk markers (like this), or prints (if you do digital calligraphy or if you digitize your work in order to make multiple copies of the same piece). I imagine that anyone would enjoy receiving something like this, especially since calligraphy makes a nice piece of home decor. If you're gifting a print or calligraphy that's done on paper, then I suggest framing it. In my opinion, framing artwork makes anything 100x fancier! For example, I made the digital calligraphy pictured above for my dad (since that's his number one favorite joke) and printed it out. Then, I used some cute washi tape to attach it to a pretty scrapbook paper "backing" and put it into a nice frame. The overall presentation and appearance of the present is good, and as a bonus, it's a very thoughtful gift that basically cost me nothing (since I already had all of the materials at home). I wish I had a picture of it, but I didn't photograph the end result before I wrapped this Christmas present! This will actually cost you some money, though you can get plain, white mugs (the main supply of this craft) for pretty cheap at Michael's, Hobby Lobby, Walmart, Target, and online shops like Amazon. You also need some sort of oil-based permanent marker. Make sure the mug is clean and then do your calligraphy onto the surface using an oil-based permanent marker. If you want to be ~fancy~, you can use several different colors (but I think it's easiest to just use plain black). Put the mug in the oven for about 25 minutes at 425 degrees Fahrenheit to let the ink set. It's that simple! 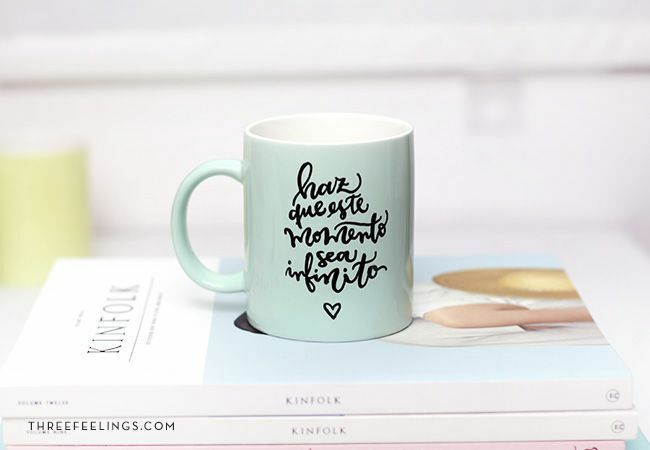 You can easily make several of these mugs in one quick calligraphy session. It's also not difficult to customize each mug for your different gift recipients, and you can make the calligraphy winter or Christmas themed to make it more appropriate for the holiday season. Kind of along the same vein, but you could also decorate solid-colored, plastic tumblers using an oil-based Sharpie. However, instead of baking, you would need to tape off the lip area and the inside and use an acrylic sealer, making very sure to not get any of the spray onto any part of the surface that would come in contact with the beverage. I don't know if using a sealer is actually completely necessary, but I think it would be a good idea to use it just in case. You can DIY different sorts of Christmas tree decorations that involve calligraphy/hand-lettering. For example, you can make mini Christmas-themed artworks on thick paper (like watercolor paper), punch a hole, and then thread twine or ribbon through so that it can be hung on a tree. In addition, you can decorate clear, plastic ornaments - which can be purchased cheaply at any craft store - using a Sharpie. Since ornaments are quite small, you can make many in a relatively short amount of time. If all else fails, then pretty up your packaging! You can get away with a somewhat mediocre gift if the exterior looks really nice. For me personally, I didn't have to spend a lot of money on presents overall because for some people, I bought an okay gift and then gave it cute packaging (and I still made people happy!). I sometimes wrote or drew on the wrapping paper itself, used really aesthetic looking twine to wrap the present, and/or attached a pretty gift tag. For some people, the gift tag itself, with their name written on it fancily, was like a personal piece of artwork for them. Basically, if the Christmas present itself is kind of lackluster, then put more effort into the presentation! Here is a good tutorial for three different very artistic winter-themed gift tags that I really liked. 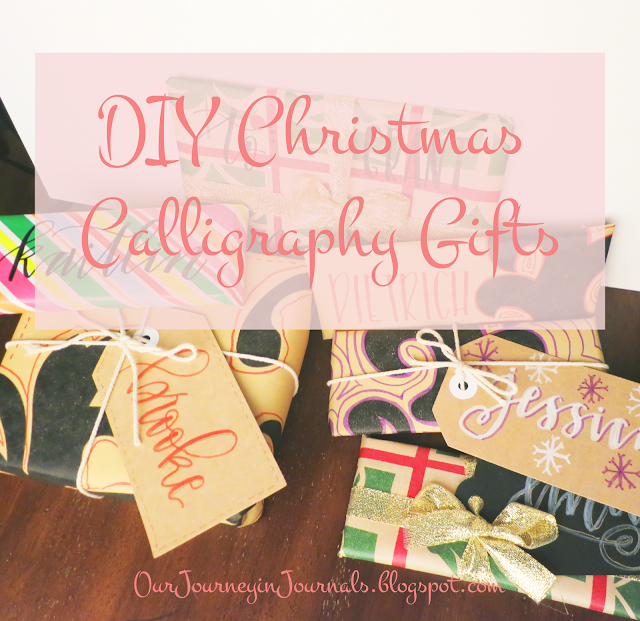 These are two very good ideas for DIY Christmas calligraphy gifts that I think would make very good gifts. However, I'm only including them as bonus ideas because they they might take more time than you to spare have since Christmas is so near. I saw this really cool tutorial on how to letter on a yoga mat to beautify any cheap yoga mat, but it takes a good amount of time to do, especially since the paint can take a day or two to fully dry. Decorating plain notebooks with calligraphy is a great idea. You can use markers, watercolor, real ink, embossing, or whatever; paper cover notebooks are a great surface to work on. However, I'm including it as a bonus idea because I think the only place most people, including myself, can buy plain cover notebooks is from online places like Etsy. That means that you would have to wait for some time for your shipment to arrive - though the project itself only takes a couple of minutes. So those were some ideas for DIY Christmas presents that you can make involving your calligraphy skills! Making your own gifts for people is such a great way to save money, and it's made so much easier nowadays with all of the inspiration one can find online (like blog posts? lol). I hope this post helps you in thinking of a great gift for your loved ones (or not-so-loved ones?) that you can make this Christmas! Merry Christmas and happy holidays! 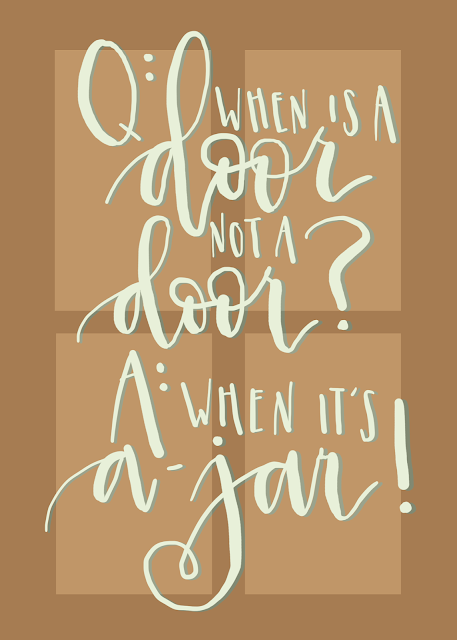 Do your Christmas gifts this year involve hand-lettering/calligraphy? 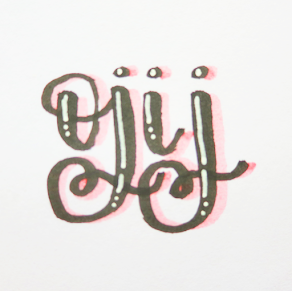 What other sort of DIY calligraphy presents did I miss in this post? Let me know by leaving a comment! Random note: thank you to Personal Capital for sharing this graphic with me and inspiring this post!